Tweedbank Gents hosted Auchinleck on Saturday and the visitors lead for most of the game. Typically the Bankies fought hard to keep themselves in with a chance and it all came down to the last bowl of the last end with Tweedbank needing five shots to win the game. Skip Kenny Johnstone played a fantastic bowl to remove an Auchinleck bowl to give Tweedbank a one shot victory 73.72, which silenced a very vocal visiting team and sent the Bankies wild with delight. A great team effort that gives them two wines from their opening games. It was a similar story in mid-week when the senior gents defeated local rivals Teviotdale by 58.57 having picked up 10 shots across the board on the last end to claim the victory. Tweedbank Ladies were on the wrong end of a 85.69 scoreline to Teviotdale ladies on Saturday. 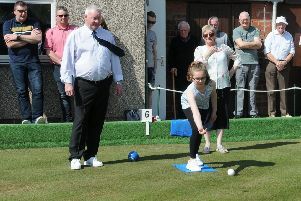 On Sunday Senior Gents Fours and Ladies Senior Singles both lost their ties in the Scottish Play Down at Bainfield to Falkirk and East Lothian respectively.